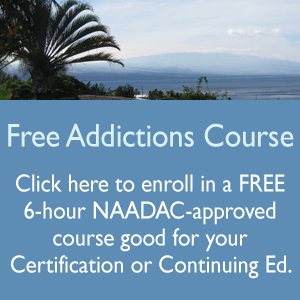 Online courses are available at anytime, and provide up to 50% of the 270 hours of training needed for an uncredentialed* individual to qualify for the Certified Substance Abuse Counselor (CSAC) certificate which is issued by the Alcohol and Drug Abuse Division (ADAD) of the Hawaii Dept. of Health. PAHA’s online courses provide the required training and have been approved by the ADAD. Our courses provide 6-hours of training each (on average), thus taking 23 online courses will contribute -50% of the training hours required. The remainder of the 270 hours must be taken as “Face to Face” instruction. Each individuals’ requirements for the CSAC credential are determined by Alcohol and Drug Abuse Division (ADAD) of the Hawaii Dept. of Health, on a case by case basis, and take into account each persons training, work experience and previously earned licensure, credentials and degrees. Be sure to enroll in the courses within the category Courses required by HI Dept of Health Alcohol and Drug Abuse Division. Final determination of hours required to be eligible to earn the CSAC in Hawaii is made by ADAD. Other states’ addiction boards have their own requirements. Once you’ve completed the required online courses, you may enroll for “Face to Face” classes with PAHA, and/or classes may be obtained at a number of approved community colleges, and universities. PAHA will be offering Face to Face classes in spring 2019, on the Big Island of Hawaii. Our classes will be led by Director of PAHA, Elizabeth Bush, APRN. Watch the site for an invitation to apply to be part of our spring 2019 cohort. In the meantime, please continue to earn online course certificates and complete the Hawaii Dept. of Health required courses, prior to applying for “Face to Face” classes. As always, feel free to contact PAHA with any questions or concerns you may have. We are here to serve you. *Registered Nurses (RNs) will need 270 hours for the CSAC certification. Advanced Practice Registered Nurses (APRNs) will need 180 hours. PhDs and MDs will need 50 hours. Final determination of educational hours needed is solely at the discretion of each state’s addiction board.